Schools and educational institutions generally have healthy annual budgets for communications spending. According to an InfoTrends Study, larger education organizations spend an average of $12 million a year in marketing and communications, with about a quarter of that budget allocated to print. Print service providers who know the dynamics of the education market will be more successful in recommending products to meet the needs of each sector of the education value chain. The advantages for the print service provider are that these applications work very well with short-run, on-demand and personalized printing for applications like brochures, direct mail, catalogs and posters. While print materials claim the largest portion of the budget, education organizations now use at least three different types of media for customer communications or marketing. Respondents to the study reported linking 52% of their print materials to digital channels; so it’s important to ensure your designs will translate well to digital media, and vice versa. 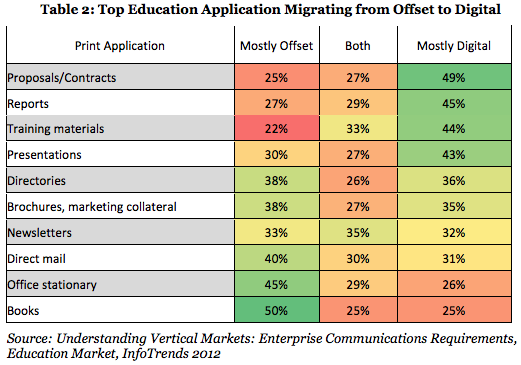 One challenge for print service providers is that most education applications are still printed offset today. However, the study finds that organizations are poised to transition to digital to reap the benefit from personalization and short-run/quick turnaround projects. 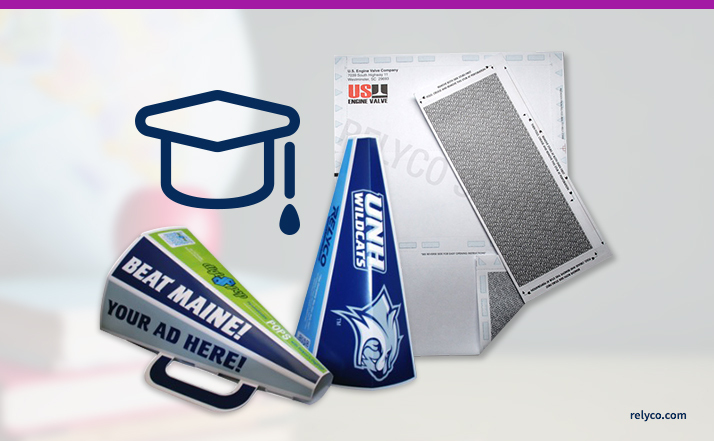 Here’s a breakdown of how schools are currently using offset printing vs. digital printing. Research revealed that the use of variable data printing is increasing, not only in the larger organizations but in the small-to-mid sized education providers as well. To capitalize on this growing segment of the marketing budgets, print service providers need to be up to date with the hardware and software products that power the variable data. Survey respondents said print accounted for 34% of their spending, and were anticipating a decline of about 7% over a two year period as dollars spent shift to video, audio, and mobile channels. However, they still see print as being at the top of the budget. Need a hand selling print services to schools and educational institutions? Click below to get your industry-specific sample kit to find out what’s possible.